Selling or buying real estate is about getting seen. And that means vibrant, attention-getting documents and proposals, put together by you . . . with a little help from Southwest! We have the equipment and supplies that residential and commercial real estate brokers, agents and companies need. For moderate to heavy use punch, bind and laminating equipment, you've come to the one place that can provide you exceptional resources, knowledgeable sales support with true industry experts, and rapid order fulfillment and same day shipping. We also offer card slitters, booklet makers and folders, with telephone installation support, and supplies matched perfectly for your output needs. In order to stand out from the dozens of competitors, wire binding was used to create well organized high-end booklets featuring the latest available properties. 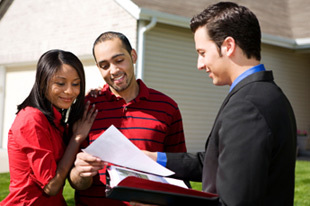 Buyer literature is key marketing material for every real estate agent. A wire bound packet allowing organization and perferated assurance forms for buyers, finished with custom tabs are just the products needed to help close the deal.